1. I’ve gotten really in to drinking tea, and have 2 cups every morning at work. I wanted to make a cute coffee mug to have, and love my new sharpie monogram mug! I followed this tutorial and it turned out great! 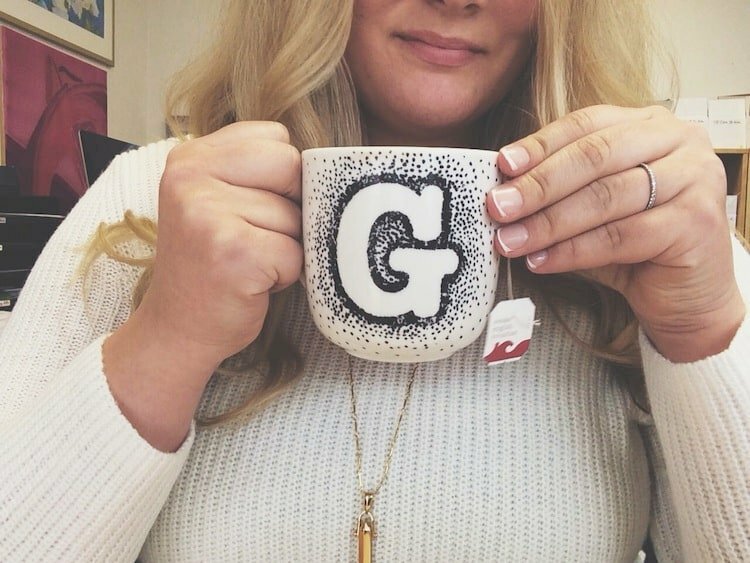 Tea’s never tasted better than in that cute little mug. 2. We went to the movies on Friday (saw Imitation Game, loved it). 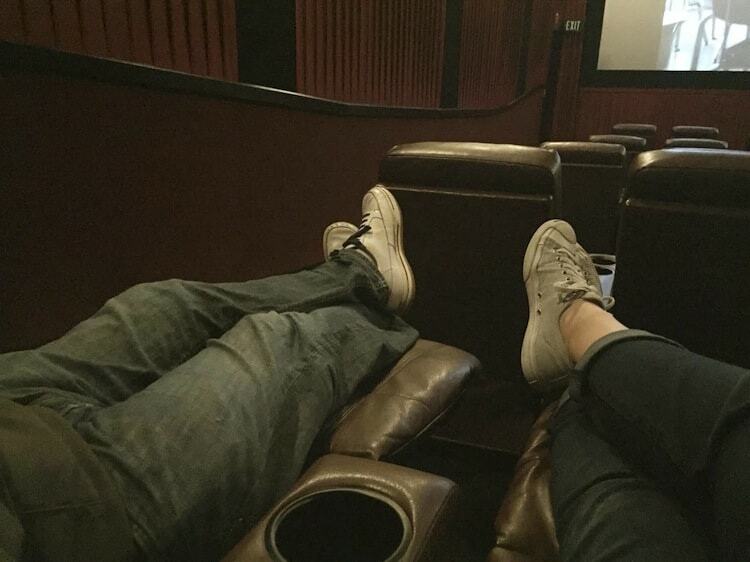 Clearly we haven’t been to the movies in a while, because when we walked in, the end of each row had these AMAZING lounger seats! They’re like 2 connected leather lazy boy chairs, but better! They fully recline, are extra wide, and had a drink holder and a snack holder. I didn’t know a chair could get me so excited. There are only 5 sets of these per theater, so now we know we need to get there early to watch movies in ultimate luxury! 3. Over the weekend, it poured rain for 3 days straight. This is kind of a big deal for this California girl. It actually felt like winter around here. 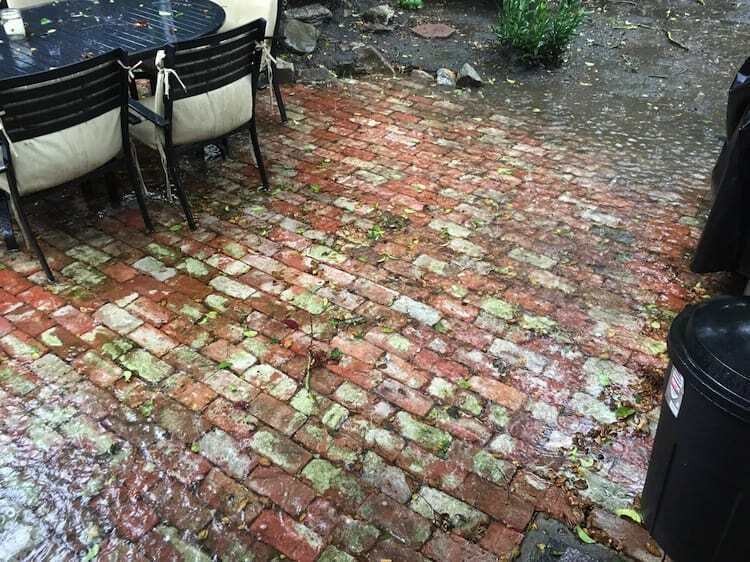 All the rain made it pretty obvious we didn’t lay our brick patio very level. Just look at that gigantic puddle! 4. All the rain left our littlest dog Max feeling very cold. We already have a vest for him to keep him warm, but he needed extra warmth this week. Whenever I sit down on the couch, he will scratch at my arm until I tuck him up into my sweatshirt. He’s like a little kangaroo baby. If he hears a noise, he’ll pop his head out through the sweatshirt hole. It’s really funny. When I got up to cook dinner, he went straight to Shawn and slipped inside his flannel jacket. He is just so cute! 5. 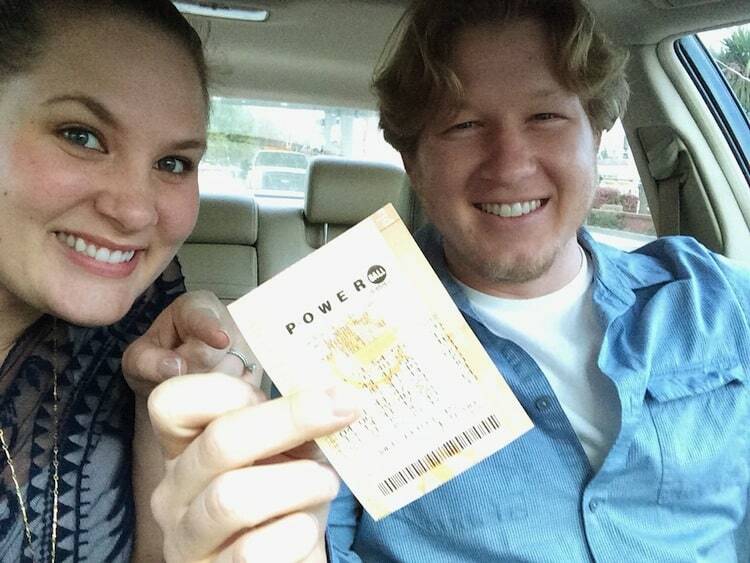 The California Lottery had built up a jackpot of $500 million this week! Shawn and I went to buy a ticket for fun, and there was a line of 5 other people doing the same. This picture would have been very famous if we had one. Sadly, we did not. But no one else hit the big jackpot either. My sister hit 2 numbers and a power ball! That’s a whopping $7! She’s basically rich now. Have a great 3 day weekend friends! Love the doggie warmer pictures. So cute! I have to invest in one of those sharpies, that mug is just the cutest! Those movie seats look amazing! The theaters around me have something similar, though I’ve never sat in one before. I must be missing out! And my husband and I bought a lottery ticket too, but no such luck. Have a great weekend, friend! You should make one Gayle! I’m not crafty at all, but had a lot of fun making it. And the next time you go to the movies, get there early and grab one of those chairs. You’ll feel like royalty! Okay, I *have* to make one of those mugs! And I’ve never seen those comfy chairs in the movies! Definitely an incentive to get there early. Max is adorable!!! What a mush. :) I can only imagine what would happen if your other fur babies decided to follow his lead! haha Have a great weekend! I love that mug – I’ve seen them on pinterest, but I’m not crafty at all. Yours came out so pretty! Oh, and I love that necklace you’re wearing – I have it too! Max is a cutie and I suspect he would hate it here on the east coast! We had -4º this morning. I’m ready for spring! 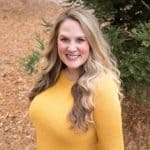 Did you get your necklace from Stella and Dot? Necklace twins! Shawn’s cousin sells it, and I’m obsessed. I have it in silver and gold. And max would probably turn into a Pupsicle if he had to be where it was -4. It dipped into the 50’s over the weekend and he was shivering! That’s exactly why I switched to tea Olivia! Coffee made my feel like I was having an anxiety attack. Worst feeling ever. Tea doesn’t do that at all. And I feel so dainty and lady like drinking it. You must make the switch! My goodness, isn’t little Max adorable! That pic is hilarious. He really is a little kangaroo baby, isn’t he? I’m sorry you didn’t win the lottery, but I’m glad your sister is rich. Maybe she will share with you. Your mug is seriously cute — love it! And all that rain did make it so cold, but man, is it nice now! I’m loving this weather but yeah, we need more rain! haha Hope you’re having a great weekend, Natalie! I’ve been drinking tea and coffee (mostly decaf) like crazy lately. There’s something about a warm beverage that’s just so comforting! I love your mug – a cute mug makes tea drinking much more fun! 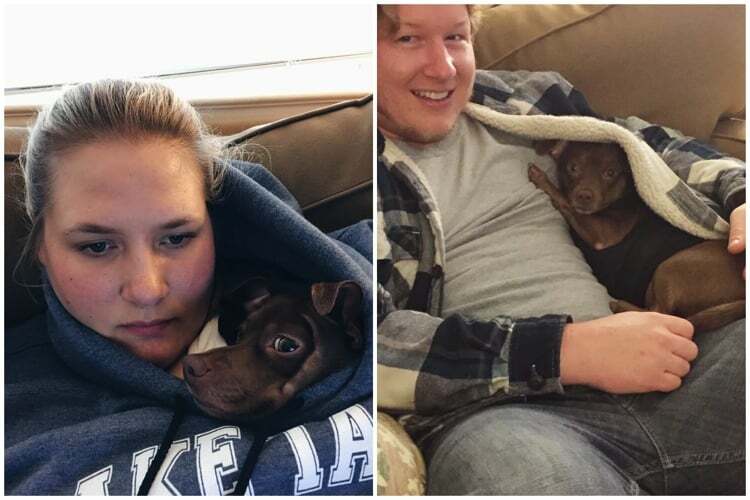 Your pup has got to be the cutest cuddler I’ve ever seen! It’s so cold here, I’m looking for anything and everything to keep me warm so I may just have to borrow your little guy! LOL. Wow, you guys got a lot of rain! Wish we could have gotten that much!! Hopefully we’ll get at least a tiny bit more before summer. :-/ Your mug is so adorable. And so is your pup! Hope you had a great weekend!